Garlic Scape and Roses, Circle: some resolution for the crazy question. My last Photo of the Week I apologized that I had been too busy to post. Things have not gotten better in that regard, and in fact I have put up a notice on for-sale pages that any photo orders won’t be fulfilled until mid June. Busyness aside, I’ve been doing a lot of new work. But the new, new work isn’t up on the site at all yet. This photo above though is interesting, and pretty new. I made the exposure last summer and it mixed in my backlog of garlic scape and roses photos I want to work on. I spend time working on these exposures at that time of year. I have had a show hanging at Long River Gallery through the spring; I just took the remaining photos down today. 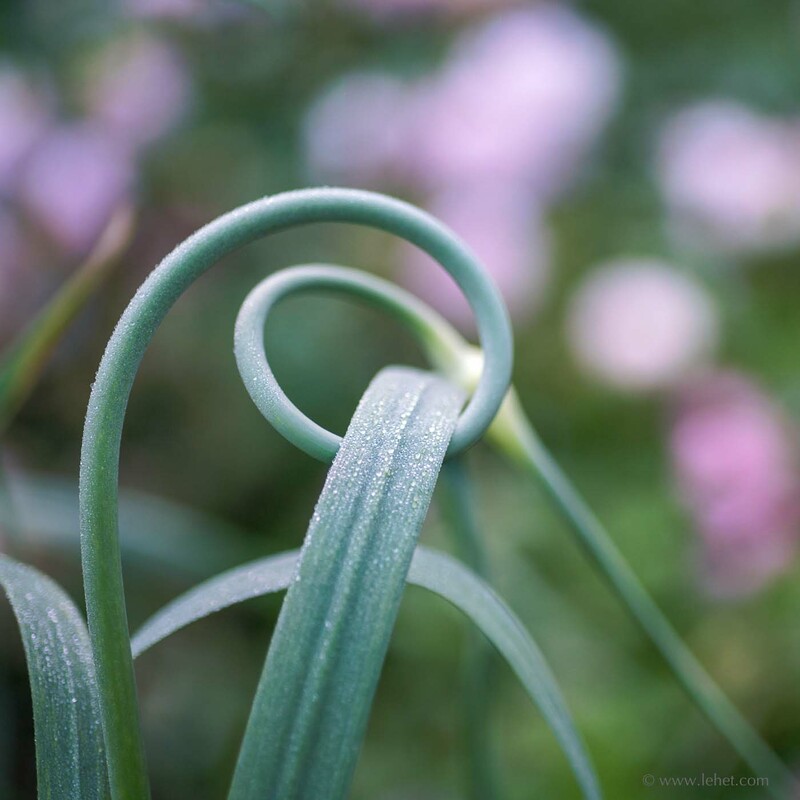 This circle-garlic-scape and roses image was included in the show as a matted print. And in fact it was the very last thing I printed and matted as I was hurrying to get the car packed and to the gallery. A friend pointed out that it was matted a little crooked, which I don’t ever do. But like I said, a hurry. And also it was done with the question: Am I crazy? If I never asked if I was crazy, regarding photography or many other matters, that would be a bad sign. It would mean I’m not pushing the edge of what I “know” and what I’m comfortable with. I really liked this photo, but I just didn’t know if it was really any good or if I was just remembering making it, or thinking about the lens that made it, or whatever happens to warp my judgement. So, included in the show as a late afterthought, and then I didn’t give it much more thought. It didn’t sell, in the small and slightly crooked mounting in the mat, but I had a handful of people tell me it was their favorite photo. So, maybe a little crazy, but not completely. This photo is for sale (to ship in mid June) here. This entry was posted in Bokeh, Flowers, garden, Pink, summer on May 30, 2018 by john lehet.